Much interest in the Global Maritime Issues Monitor 2018, which collates the thoughts of senior maritime stakeholders from more than 50 countries, specifically focusing on the impact and likelihood of a number of issues potentially affecting the global maritime industry over the next ten years, and their preparedness against them. 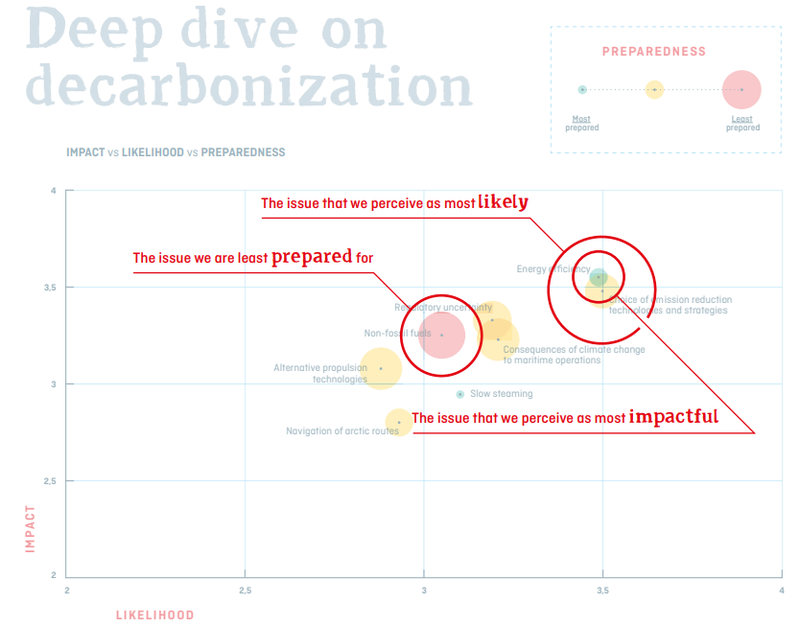 While much of the coverage led with the ‘industry not ready’ line, the report itself details several potential ways forward to address the issues considered most important, and with particular focus on areas such as digitalisation and decarbonisation. Energy efficiency was predicted as the area to have the greatest impact on the sector in the next decade, with respondents suggesting that improving the energy efficiency of vessels and deciding on a strategy to reduce GHG emissions are two very important first steps on the path towards this goal. The role of technology is crucial to addressing these needs, and maritime executives will be faced with an ever-expanding menu of tech options in the coming years. Congratulations to the Global Maritime Forum for undertaking such challenging research to help to focus industry efforts on the areas of potential greatest urgency. Norway aims to strengthen its position as a global leader in Blue Economy innovation with the launch of a new ocean innovation hub. REV Ocean, WWF, Intergovernmental Oceanographic Commission (IOC) of UNESCO, UN Environment, BI Norwegian Business School and the Norwegian Institute of Marine Research have joined forces to launch a centre focused on global ocean solutions. Opened in the presence of Norwegian Prime Minister, Erna Solberg, the World Ocean Headquarters, outside Oslo, aims to act as a hub for knowledge-based institutions related to the Blue Economy. Initial areas of focus are named as sustainable fisheries and ocean management; shipping; marine technology and aquaculture. Both the Norwegian Prime Minister and IOC of Unesco gave warm welcomes to the site at the launch. This is the latest in a series of high profile Norwegian investments, including announcing a high-level panel on building a sustainable ocean economy at Davos at the start of the year and launching a comprehensive Ocean Strategy last year. The benefits of floating offshore wind energy were trumpeted this week, at the same time as calling for further action to cement progress. WindEurope paints a picture that – with the right backing – floating wind power costs could fall to reach €40-60/MWh by 2030, down from today’s €180-200/MWh (US$207/MWh). As they do not have to be anchored, floating turbines can push further offshore, where the potential for energy harvesting is greater and the potential for conflicts with other sea activities (shipping, fishing and leisure activities) is reduced. The first and only fully-operational floating wind farm, Hywind Scotland, started to operate fully off the coast of Aberdeen last year, launching with six floating turbines with a total capacity of 30 MW. Interesting autonomy news this week, as a report suggests that of the three driverless sectors studied (seafaring vessels, cars and aerial vehicles), it’s the autonomous vessel market that exhibits the least risk. Conducted by the International Underwriting Association (IUA), the report was based on interviews with industry experts in autonomy. While a relatively small sample (27 individuals representing 16 IUA member companies, one legal firm and one insurance market association), respondents already offer or are thinking of offering insurance products in associated sectors, so are studying the issues carefully. Unsurprisingly, collision was deemed to be the most significant risk presented, as an average, across the three technologies, with the lowest by a considerable margin being patent / copyright risk. Amongst the other findings, regulation at a global level was considered most relevant to autonomous vessels. In directly related news, the IUA report followed hard on the heels of the announcement of new funding specifically to focus on ways to regulate the autonomous and smart shipping industries to help them deliver innovative new technologies to the traditional maritime sector. Project partners the Maritime & Coastguard Agency and the Department for Transport, in collaboration with the National Oceanography Center’s Marine Robotics Innovation Centre, successfully secured £1 million from the Department for Business, Energy and Industrial Strategy’s Regulators’ Pioneer Fund to undertake the work. Amongst other initiatives, the funding will support the launch of a Maritime Autonomy Regulation Lab. Good luck to all partners. Please check back soon for more Blue Economy Technology news.